I arrived at TBIT LAX with maximum time to enjoy the Qantas First Class Lounge. Check-in was a breeze and security wasn't too bad as well. Off to the lounge following my JAL map. Other bloggers have proclaimed the Qantas First Class Lounge at LAX to be the best lounge in the United States. While I don't have the same comps, I post no argument. To begin it's a beautiful lounge. There are various stations throughout where you can find snacks and beverages. Hey, they even have different size chairs for different size folks. The Spring menu was available today. Breakfast is served until 11:30 with lunch at noon. Let's get on the jet. Champagne or juice along with an oshibori was offered immediately. I'm pacing myself on the drink even tho it is 5 in Tokyo, 5AM. First class was 8 for 8 today with yours truly getting the last window seat, right side, row 1. A quick peek into the two row mini-business cabin behind first. Doesn't look too shabby either. While these pods are open suites, they are extremely private. Realistically I'd take any of them as they were all good and had their highlights (plus they are first class seats going somewhere internationally!). But to me JAL was better against the competition simply because it doesn't have any faults. It was comfortable as a seat and a bed. It had plenty of room with privacy. Storage was superb and the IFE monitor was excellent. Granted my list isn't all inclusive and this is just a seat/bed comparison. Etihad: Say what! Better than the Apartment? Yes, while the Apartment is exclusive and secluded, the bed is narrow and uncomfortable plus you can't recline the seat. Cathay Pacific: The JAL seat is similar but was more comfortable as a bed and has a better monitor. You can have a dining partner with both seats. Lufthansa: Great seat, uncomfortable as a bed. The JAL airweave mattress was outstanding for sleeping. ANA: JAL has superior storage, which wasn't hard versus ANA's Square as that one is poorly designed. 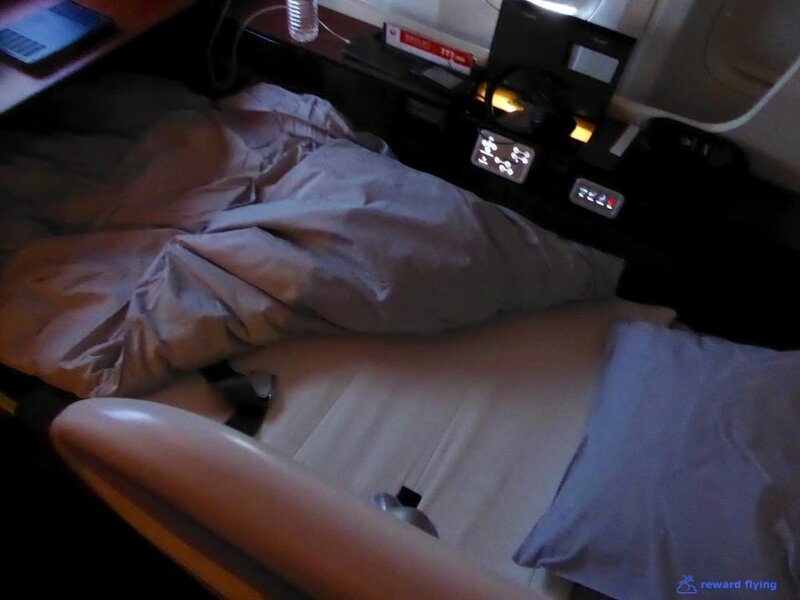 The JAL Suite was better thought out in my opinion, and more comfortable as a bed and a seat. Plus ANA's Square blocked the window. Thai: The main reason against Thai is the bed, among other defaults. Thai has that uncomfortable hump in the middle when lying down. United: While United's bedding is second to none, the design of the JAL Suite beats the Global First pod in every other category. Qantas: QF turns into a comfortable bed but it's an old design and JAL has better storage, IFE monitor and you can look out the window! Plane-sighting had A380's going trans-Atlantic. And 777's going trans-Pacific., including JL61, JA740J. Favorable winds took a direct route across the Pacific as opposed to heading north along the Alaskan coastline. JAL's service was precise and immaculate. The cabin was under the control of 4 Japanese women who all introduced themselves as well as spoke excellent english. When faced with this choice what would you do? These champagnes run from $200 to $500 per bottle according to a Google search. While I sip on this how about a look around the seat and a visit to the lavatory to change into these Porsche Designed incredibly comfortable pajamas. The standard 777 lavatory stocked with dental assistance and well, you have to love the Japanese propensity for personal hygiene. The lavatory in the first class cabin was a little larger and Natsuke, one of the lovely flight attendants on today's flight, prepared it for me to change into what are now my favorite airline pjs. Properly attired for a 10 hour flight it was back to the champagne and a look around. The seat comes with an instruction manual. This is not your average pillow. Nor is this your average monitor. Who needs an overhead bin when you have an ottoman. Storage areas around the seat were plentiful with the game controller stashed away. These bins were very deep. Along with a nifty place to re-charge your electronic devices and have them out of the way when you don't need them. The seats have multiple control pads as well as access to the monitor remote controller and a tidy up mirror. The pod has reading lights on both sides with one side doing double duty as the headphone hook. It does get to be time for bed at some point. The only problem is the drink, food and service is so good on JAL, who wants to sleep? But if you do the airweave mattress is like sleeping in your own bed. The duvet is soft and warm. The pillow is large. My recommendation, watch TV in bed while eating and drinking. When it came to amenities there was no let down as well. A useful kit along with a large sample of, in my case, men's skin care products. But the hit, for me, was the Porsche Design Sleepwear. I would buy this product. The inflight entertainment systems is quality as well. Easy to operate with the handheld controller that gave access to plenty of movies and tv shows to watch on the oversized monitor. 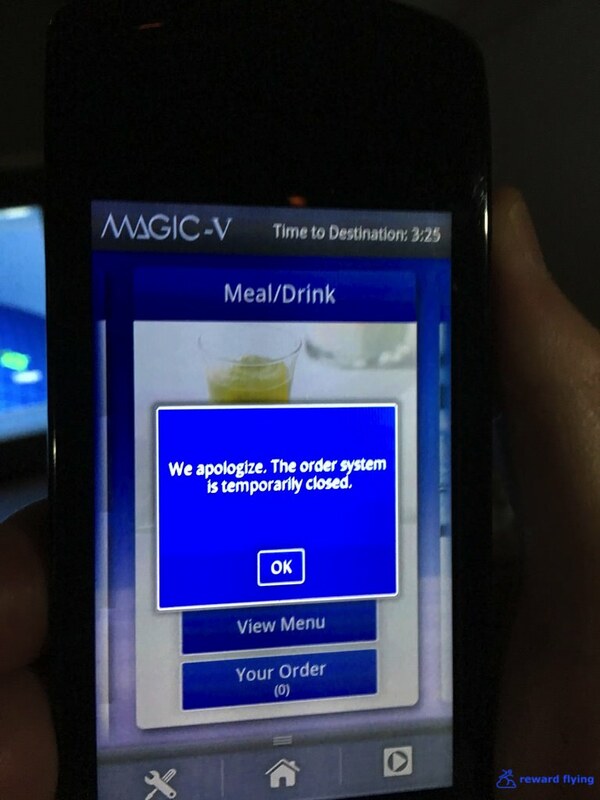 The only issue was ordering food via the system which apparently JAL doesn't offer on any flight, at least the ones I've taken because it's always out of order. The airshow is fine as well. And a touch of class, free Wi-Fi for first class passengers. While I didn't have a speed test app on my phone, I was able to send a photo over the Pacific which I could not do when paying for wi-fi on ANA last summer. Hungry, or maybe just annoyed I've saved the food for last? Starting with the beverage menu. Specialty Japanese wines and sake. Specialty Coffee and Tea as well. Food menus consisted of Japanese and Western fare along with Ala Carte and prior to arrival dining. The tray is removed from its locked position under the monitor and the table is set. 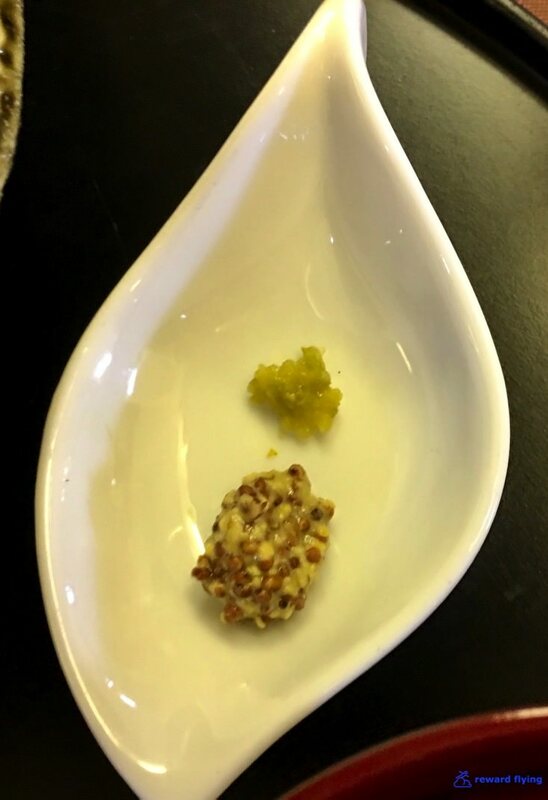 While pondering what I'd already decided the amuse was served. Probably my only compliant for 11 hours was there was only 3 blinis. The white truffle honey was outstanding. At this point I went kicking and screaming away from the champagne to this French Bordeaux, which is about a $60USD bottle of wine. I had decided on having the Japanese entry when I booked the flight. First up was Kozara. All were delicious and restaurant quality with only the Sea-bream being slightly dry and, gasp, a small bone. The Mukozuke and Azukebachi were served on the same plate. Mukozuke - Seared Tuna & Steamed Sea Urchin, I don't recall ever having fresher Sashimi, although the owner of the sushi place I visit wouldn't be happy with that comment. Beef can never be prepared properly on a plane???? Next presented without a request was the cheese course. I was only happy to oblige. Natsuke explained the cheeses describing the brie as "cream cheese". Finally it was dessert time. Natsuke proactively brought something from the Western side along with the Minamoto Kitchoan which is a delicious cookie. She paired it with Jasmine Cream with Pear from a place in Los Angeles named Jin Patisserie. Both were delicious, and not too sweet. Natsuke returned in 4 minutes to press. Later on I tried this special Royal Blue Tea "Queen of Blue". "Toho Beautiful" named by Queen Victoria of the British Empire is the finest blue tea representing Taiwan, which has been loved all over the world. The story of the tea is unique, and when a small insect named Unka chews the tea buds during the summer tea picking time, the bitten part promotes natural fermentation and has a unique gentle sweetness flavor. It is also a valuable tea to harvest only the part of the young buds carefully once a year, in the summer. Royal Blue Tea has a collection for each grade as "Queen of Blue".Deluxe is equipped with JAL international first class all-round, Belgium · Monde Selection received the third consecutive Gold Award. · Exquisite refreshing and elegant refreshing, "ladies of tea"
It is a sweet scent and soft taste like fruit and honey due to grace brought by unca. Although it is close to black tea, it is a sweetness with no astringent and clean. It is compatible with any dish, it is delicious with no tired eyes. Mid-flight I ordered the JAL Healthy Ramen Noodles. This was probably my least favorite item on this flight. For the pre-arrival meal I stuck to Japanese, why mess with success? Although the Rossine Style Foie Gras Slider was tempting. And a second helping of Miso soup, I saved you from a view of the first serving. All in all, spectacular food and drink on Japan Airlines. ✔︎ Can I stay and watch some more? ✔︎ Made the flight special. The only thing that was better on ANA's flight to Tokyo was a handwritten note from the flight attendants. Hardly a reason to penalize a rating. This was a 10 year old 777. Excellent plane but not new technology. If this was on an A380/B747-8i the total rating would be 9 of 10. You can get reward tickets from two United States programs for this flight. American charges 80,000 points for a one-way first class trip (and probably AA's best point redemption) to Japan on Japan Airlines or American metal. Or you can pay less by using 70,000 Alaska Airlines points on JAL. Taxes and fees were around $50.00. A great deal across the Pacific.